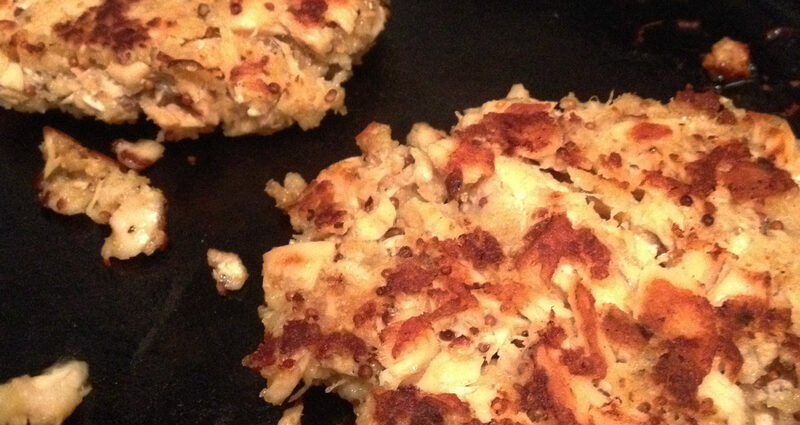 Those recipes – ubiquitous on the internets – for salmon cakes didn’t appeal to me. I wanted something simple that I could prepare in a flash. So here’s what I came up with – no measuring spoons or cups required! All measurements are approximate. Eyeball it! And here’s a tip: bake your fish in a cast iron pan to save on aluminum foil. Bake two salmon fillets for 10 minutes at 400 degrees Fahrenheit. While salmon cooks, mix remaining ingredients in a bowl. Flake cooked fish and add to mixture. Heat greased pan on medium or medium-low. Form salmon into patties and place in hot pan. Add flour to salmon mixture if needed to hold patty shape. Cook about 2 minutes each side or until nicely browned. That’s it. No dicing, no extra steps, no frills. BONUS: they’re tasty served hot or cold (break up leftover cakes and add to a salad!) and kid friendly, too. After you cook the first salmon cake, taste it. If it needs a little more of certain ingredients, you can add them before cooking up the rest of the patties. What’s your favorite side dish to serve with salmon cakes?